The Bonnie Ship "The Diamond"
Lead vocals on "On Country Comfort" and "The Boston Burglar". Lead vocals on "On Save the Land" and "The Diamond". Lead vocals on "The Men Behind the Wire" and "Skye Boat Song", and the solo singer on "Girl From the North Country" and "The Youth of the Heart". Lead vocals on "Paddy on the Railway", "Lord of the Dance", "The Nightingale" and "The Grey Funnel Line". "The Men Behind The Wire" is a well-known song written by Paddy McGuigan — un-credited on this album. © 1972 Audio Fidelity Records, a division of Audiofidelity Enterprises, Inc. There are certainly not many singing groups running around these days with a songbook in their heads ranging from centuries-old folksongs to Bob Dylan and Elton John, from traditional Irish to contemporary Belfast, from ancient sea chanteys to their modern equivalent, from Jesus to ecology. There is, as a matter of fact, only one such wildly varied group in the whole wide world — and here they are: Paddy, Tom and Liam, and their good friend Louis Killen. Almost everything in this collection will be new even to the most devoted Clancy fans, for the very good reason that the boys have never recorded them before. But with the help of some friends (not to mention their favorite arranger, J. J. Jameson), the material quickly got to sound exactly like what most of it will now be — permanent parts of the vast and rich Clancy repertoire. A couple of items might call for a touch of explanation. The moving title song is by a talented young Australian writer named Bruce Woodley; it has never been recorded by anyone. (Woodley's friend, guitarist Barry Kornfeld, in addition to his many other good deeds on this album, forcibly brought this number to the Clancys' attention.) The Bob Dylan song re-interpreted here by Liam has also been recorded by its composer under the title "North Country Blues" (which it is not). And, in accordance with the British slang practice of referring to steamship companies by the color of their boats' funnels, the Grey Funnel Line is the Royal Navy. The second album with Louis Killen shows a more contemporary feel and was also produced by Orrin Keepnews. Clearly, an effort was being made to keep up with the times. This album was the hardest to find of any album in my collection. Audio Fidelity, by this time, had fallen on hard times and their distribution was less than stellar, which was a shame. 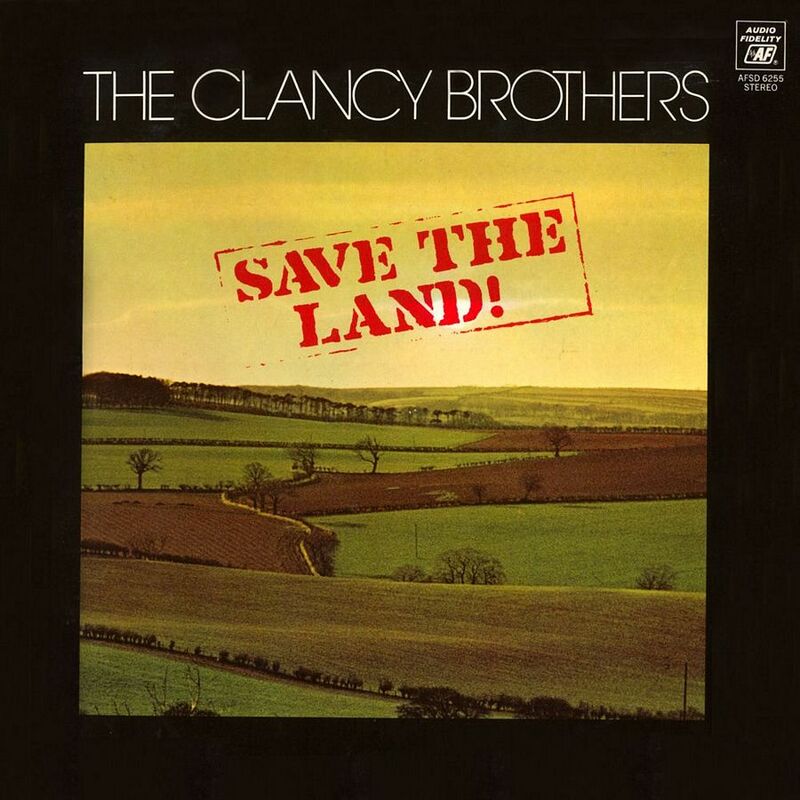 This is a good album with an Irish landscape scene for the album cover. 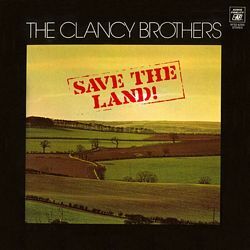 The lead track, "Save The Land", is a very powerful song in the singer-songwriter vein, which features great vocals by Tom and great lead guitar work. Louis then sings the lead on "Paddy on the Railway", a great song. This album features Louis singing lead vocals on four tracks, which is the same number of songs that Liam sings lead on. Paddy and Tom both get two songs each — very interesting in that this album is really the only one that features Louis Killen as an equal member of the group. Liam then sings a good version of the Bob Dylan song "Girl From the North Country." Keepnews Sleeve Notes are incorrect about this song in that he states that Dylan recorded it as "North Country Blues" and that this song is not a blues song. In fact, "North Country Blues" is an entirely different song that was on the Dylan album "The Times They Are A-Changin", while "Girl From the North Country" was on the Dylan album "The Freewheelin Bob Dylan." Paddy then takes the lead on an Elton John song, "Country Comfort", which works much better than one might think. It's a great performance. Liam then takes the lead on the traditional song "The Youth of the Heart," a song about a man who waits too long to marry his sweetheart because he's being too practical about money. Tom then takes the lead on the great sea song "The Bonnie Ship The Diamond" to close out side one in strong fashion. Side two starts with "The Men Behind The Wire", another contemporary song about the Troubles, specifically referencing the Internment issue. Liam sings the lead on this powerful song and this is a great version. Louis then takes the lead on two tracks in a row, "Lord of the Dance" and "Grey Funnel Line." The former is a slower arrangement than one usually hears and it works well. The latter is a slow sea chanty that is done very well, but it kind of gets lost in the shuffle in that it follows another slow song sung by Louis. This is unfortunate because on its own its a great song. 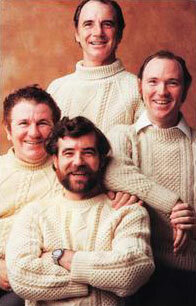 Liam takes the lead next on a nice version of "The Skye Boat Song", which is a great song. This is followed by Paddy singing the Delia Murphy standard "The Boston Burglar", a song that I don't really care for. Louis ends the album taking the lead on the English song "The Nightengale." This is a different song altogether from its namesake that Liam sings on Recorded Live In Ireland and on his solo Vanguard LP. This track is significant in that it features the first time Liam plays concertina on a record. Liam and Louis both play concertina on this track in a very effective instrumental duet. This LP is not available on CD, nor are any of its individual tracks. I rate this album a B+.